To be able to party till the sunrise, the Positivus Festival visitors should think about their nutrition during it: both food and beverages. Thinking of the comfort of its visitors, the Positivus Festival has been expanding the list of its caterers every year, choosing those who offer the highest quality meals; also, care is taken that the menus are suited for gourmands who are always ready to experiment and those who do not eat, for example, meat or dairy products. Also, if you have decided to take with you your own food and beverages, there are some things to be considered. It is forbidden to carry into the Festival’s territory food and beverages; the prohibition does not apply to special infant food and food for children up to three years. But do not worry – you will not be left hungry. 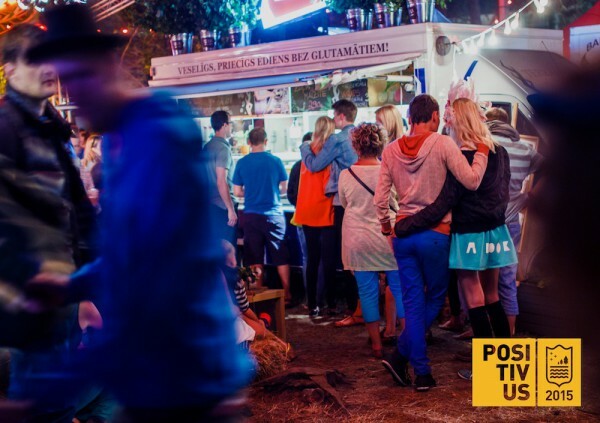 At this year’s Positivus Festival, more than thirty caterers will offer versatile food, and there will be four food courts. In the Large Food Court there will be the traditional open-air offers from restaurants as well as dainties from the Latvian countryside. The Fresh Garden food court will be favoured not only by the raw-eaters and slow food fans but also by those who want to find out that healthy food can also be very tasty. We invite our visitors to delve into the versatility of tastes, choosing not only fast food but also slowly processed healthy food. In the Trailer Park, the food offered will be for those who seek serious gastronomic experiences, with a feel of the largest US festivals. The focus in this food court will be on fast service and a versatile offering for any gourmet. And in the Tent Campsite, the caterers will offer both rich breakfast and nourishing dinners before the party all night long. You can carry your own food and beverages into the Tent Campsite, but, to not confuse your stomach, we recommend that you take with you products that can tolerate hot weather. It means that dairy and meat products, fish and other products usually kept in a fridge should be left at home; even a thermal bag will survive only one day. But you can take with you grain, seed and dried fruit bars, nuts, dried fruit, confectionary without cream, for example, muffins, dark bread or full grain bread to top with tomatoes and/or cucumbers. To feel good through the Festival, remember to drink a sufficient amount of water: an adult should drink at least eight glasses of water per day. If it’s very hot or you are using alcohol, you should drink even more water to avoid dehydration. Wash your hands as often as possible, and it is mandatory before eating. If you notice signs of possible intoxication - dizziness, nausea, bellyache or simply feel bad, go to the doctors on duty. Ambulances will be on duty both in the Tent Campsite and the Festival’s territory; you can ask for help also the nearest security guard. The 9th Positivus Festival, which will take place from July 17 till July 19 in Salacgrīva, Zvejnieku Park, as traditionally will be an exciting event for the fans of high-grade music and crazy parties. Red Bull Music Academy Stage: Camo & Krooked, Egyptian Lover, Dorian Concept Trio, DJ Sliink, Breach, DJ AI-VA, DJ Mr Krime, Without Letters, Dave Storm Live, Break Da Funk, Avoid Dave, Grind Live, Münpauzn, Bandmaster, Smthing Smthing, DJ Quest & Paul Oja, Mr Nestor, Niklāvz, Formacja/ Mr Krime Live Band. The main partner of the Festival is Lattelecom, which offers the only TV channel devoted to the Festival in Europe, 360TV Positivus, and provides modern technologies at the venue. The Festival is supported by Nordea and Tuborg. The latest news of the Festival can be heard on Radio SWF, the official radio of the Positivus Festival. Tastes to the Cinema Tent will be provided by Ādažu čipsi. Festival tickets can be bought on www.positivusfestival.com and from Biļešu Serviss ticket offices and Nordea ATMs. A three-day ticket without a tent space costs EUR 65.00; a three-day ticket with a tent space costs EUR 71.00. One-day tickets are also available at the price of EUR 35.00. Tickets without a commission fee are available on www.positivusfestival.com.